There are three really big Kickstarter projects closing in on the home stretch that are related to the kind of games featured on this site. Instead of laughing at my bad, rushed fan art up there, check out the project descriptions! Mighty No. 9 – Created by a team of classic Mega Man stalwarts and led by Keiji Inafune, Mighty No. 9 looks to be more than just a spiritual successor to the Blue Bomber’s series and more like a new beginning for the creators themselves to bring fans the kind of game we all want. This project was funded with the quickness and is now blasting its way through some stretch goals that would make the game even better. Shantae: Half-Genie Hero – WayForword’s blessed us with some great licensed revivals recently, including Duck Tales Remastered and Double Dragon Neon. This Kickstarter is to help get their own classic platforming hero, Shantae, into a brand-new game for her to run, jump, dance and whip her hair through. This project has been funded (AW YEAH!) and is whipping its way to the stretch goal of a new mode with Shantae’s nemesis, Risky Boots! River City Ransom: Underground – A group named Conatus Creative started this one to fund a true, official follow-up River City Ransom, one of the greatest beat-em-ups of all time. The crew promises more of everything, including characters, locations, items, the works. They even have Yoshihisa Kishimoto, the creator of Kunio-Kun and Double Dragon series, as an advisor on the project. This project isn’t getting the attention it deserves, so I hope others spread the word about this along with the other projects. I know money’s tight, especially with three Kickstarters like this going on that the same time, but I hope those who can spare the money will at least donate a little bit to help out those projects. 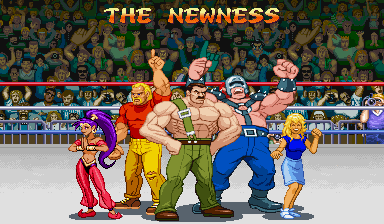 These projects, especially River City Ransom: Underground, really need the word spread about them, because a lot of people haven’t even heard this is going on. Please post about these games anywhere you can! My earlier reason for putting the site on hold for a bit (details here) just got compounded by more activity book commission work. I’ve got a feeling that it’ll probably kill most of my Halloween plans for the site, so here’s an update that’s a mix of things I planned to post later, some catch-up/clean-up work and some word-spreading for all those classic side-scroller Kickstarters wandering around. 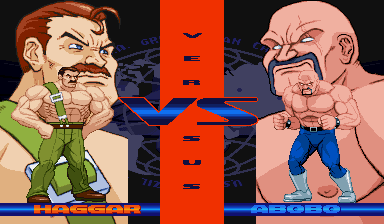 GFX Generators – Three fonts from Street Fighter Alpha 2 and the font from Bad Dudes vs. Dragonninja were added to the GroupShot generator. 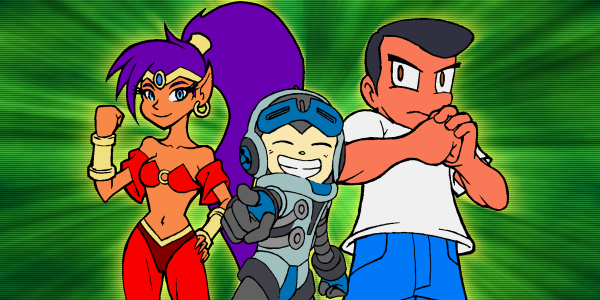 Shantae: Half-Genie Hero – WayForword’s blessed us with some great licensed revivals recently, including Duck Tales Remastered and Double Dragon Neon. This Kickstarter is to help get their own classic platforming hero, Shantae, into a brand-new game for her to run, jump, dance and whip her hair through. I know money’s tight, especially with three Kickstarters like this going on that the same time, but I hope those who can spare the money will at least donate a little bit to help out those projects. Even spreading the word and linking to the projects will help get them funded or hit those stretch goals. As the title says, the site is on pause for about a month and a half. Besides being tired from extra day job hours and a group of irritating things (spotty ‘net connection, computer issues) that make working on the site difficult, I need some rest. I also need to work on some other things, even though some of those things are related to the site. Hopefully, enough of these technical issues will be fixed by Halloween so I can get back to making enough content for updates. There will still be some additions and fixes made to the site during the pause and both the Tumblr and Twitter accounts will remain active. Things should be up and running in time for Halloween and content based on a few monster-themed side-scrollers celebrating a 25th anniversary. Sorry for laming out for a while and I hope you’ll be back for the creature feature goodness!